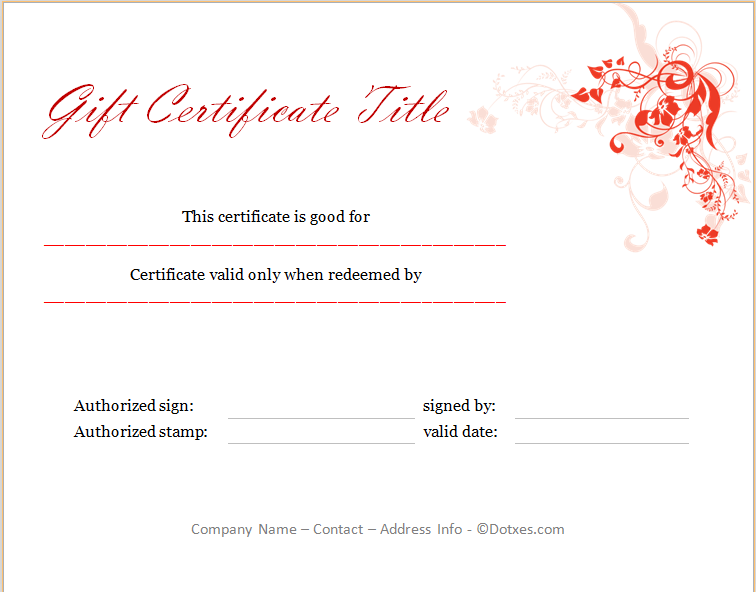 As a business, one of the greatest ways to draw new customers in is to sell gift certificates to your current customers. Gift certificates are the perfect gift during the holidays, so you want to be sure to offer them to your customers. You might be wondering just how this can be done… this Holiday Gift Certificate Template is just the thing that you need. Professional in appearance, this Holiday Gift Certificate Template includes space for a title, so that you can customize it to fit your business. The template also includes space for the date that the certificate is valid through, so that you don’t have to worry about having unused certificates out there, years down the road. The certificate is eye-catching and perfect as a gift. Always track the gift certificates that your business has out, so that you remember just how much money you “owe”. Always authorize the certificate with a signature and/or stamp in the space provided. Customize the certificate to fit your company and your company’s needs. Advertise your gift certificates, especially during the holiday season. So many templates to choose from! Easy to use 🙂 Thanks so much!!! easy to find and print and fill out!